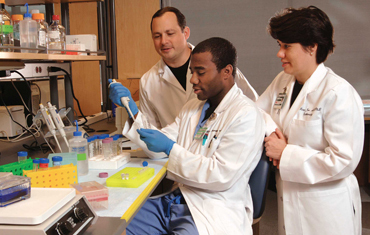 The Vanderbilt Eye Institute recognizes the critical need for exposure to research in shaping physician development, so our residency program requires active participation in research for the second and third years of training. This program is administered by our faculty with the guidance of the Resident Research Committee chaired by Dr. Tonia Rex, PhD, Director of Resident Research. The committee provides guidance to the residents in the administration, design, execution and presentation of their research projects. The breadth of our faculty provides for a wide array of projects, including bench, clinical, translational and epidemiological science. Case reports and reviews of the literature are important aspects of resident training, but not appropriate for the formal research requirement. First year residents are encouraged to focus on their clinical acumen. Research is allowed with permission from the Residency Director. At the beginning of the second and third year, each resident will meet with Dr. Rex to discuss possible projects and faculty mentors and to begin to formulate a research plan. Residents should keep in mind that certain projects involving clinical interventions (prospective studies) or chart reviews (retrospective) are likely to require additional Institutional Review Board (IRB) approval. Residents need to work with their faculty mentor to make sure that all appropriate approvals are obtained prior to beginning formal work on the project. Residents are encouraged to openly seek assistance when necessary. Residents who have made substantial progress in completing a research project are encouraged to present their results at the annual meeting of the Association for Research in Vision and Ophthalmology (ARVO: http://www.arvo.org). Residents whose research is accepted for presentation at ARVO will be provided time and support to attend the meeting. Ouarterly, faculty and trainees from Vanderbilt Eye Institute clinics and research laboratories meet to discuss ongoing research. At each meeting there is a presentation by one post-doctoral fellow or graduate student and one resident. Presentations are very brief and are followed by a longer discussion period. The goal of these sessions is to foster cross-talk between clinicians and basic science researchers to benefit each. At the end of each academic year, the Vanderbilt Eye Institute sets aside a half-day symposium to allow residents an opportunity to present their research. The presentation must be accompanied by a manuscript describing the same project in the format of an appropriate peer-reviewed journal. The Resident Research Committee selects from these one or more for acknowledgement at the year-end celebration honoring the graduating residents and clinical fellows. Participation in Resident Research Day is required for all residents executing a research project during the academic year. 2018 Winner: Joshua Barnett, M.D., Ph.D.
2017 Winner: Ian Thompson, M.D. 2016 Winner: Niraj Nathan, M.D. 2015 Winner: Caroline Vargason, M.D., Ph.D.
2014 Winner: Christopher Estopinal, M.D. 2013 Winner: Samantha Williamson, M.D. 2012 Winner: Karsa Attaran Rezaei, M.D. 2011 Winner: Sarita B. Dave, M.D. 2010 Winner: Maziar Lalezary, M.D.